The cuisine in the Netherlands, generally takes advantage of local agricultural produce, as well as fish and seafood. Beef, chicken and pork are all popular, and there are many dishes based around these. For more than 250 years, the Netherlands ruled over the Dutch East Indies (Dutch: Nederlands-Indië) - which has since become the independent state of Indonesia - and this colonial past has left its mark in Dutch cuisine. Indonesian food is very popular in the Netherlands, and even "Chinese" restaurants generally offer some Indonesian dishes. Furthermore some Indonesian dishes, such as nasi goreng (fried rice with spices and meat - usually chicken or pork) have been adopted as Dutch too. There are even some dishes, such as Spekkoek, a type of spicy pastry dessert, which combine Dutch and Indonesian influences. Boerenkoolstamppot - A stew made with potato and kale. It is served with gravy and rookwurst (a Dutch spicy sausage with a smoked flavor). Hete bliksem - Boiled potatoes and green apples, with syrup (Dutch: stroop), or "speck" (juniper-flavored dry-cured ham). Hutspot - A vegetable stew made with both boiled and mashed potato, as well as carrots and onions. Stamppot rauwe andijvie - Raw endive (a variant of chicory) mashed into potatoes, and served with diced and fried "speck" (juniper-flavored dry-cured ham). Zuurkoolstamppot - Mashed potatoes with sauerkraut (pickled cabbage). This dish is normally served with bacon or sauced, and sometimes, to add an exotic flavor, curry power, pineapple or raisins may be added. Balkenbrij - Balkenbrij is a liverwurst (Dutch: leverworst) sausage - a pork sausage containing just enough pork liver to have that distinctive liver taste - that comes in "loaves". It is cut into thick slices approximately ½ (1 centimeter thick), and the slices are then fried. Spekdik - Savory pancakes with bacon. Appeltaart - The Dutch of apple pie. It is usually flavored with cinnamon, lemon and raisins, and has a distinctive top made from a lattice of pastry strips. Krentjebrij - A porridge-like dessert with berries that is eaten cold. 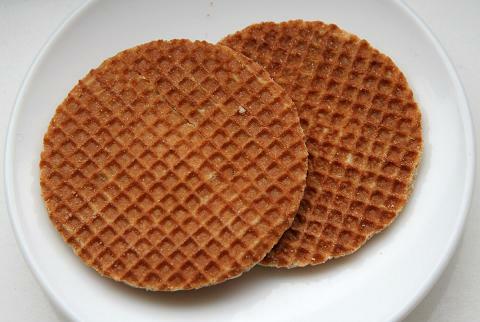 Stroopwafel - Two round waffle-like wafers, with a layer of caramel filling inbetween them. Spekkoek - This pastry combines Dutch and Indonesian influences. It is made from many layers of pastry, and has a unique spicy flavor. Oliebollen - The Dutch version of donuts. Dough is simply deep-fried, allow to cool (during which time it rises), and sprinkled with powdered sugar. Oliebollen are often available at fun fairs, but are particularly eaten between Christmas and New Year.